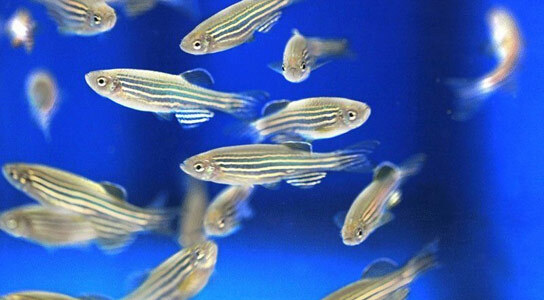 Scientists at the Max Planck Institute have discovered how pigment cells arise and interact to form the ‘zebra’ pattern in zebrafish. The zebrafish, a small fresh water fish, owes its name to a striking pattern of blue stripes alternating with golden stripes. 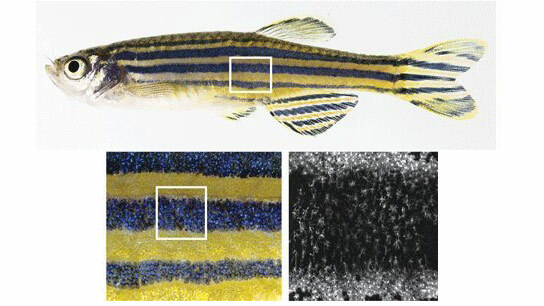 Three major pigment cell types, black cells, reflective silvery cells, and yellow cells emerge during growth in the skin of the tiny juvenile fish and arrange as a multilayered mosaic to compose the characteristic color pattern. While it was known that all three cell types have to interact to form proper stripes, the embryonic origin of the pigment cells that develop the stripes of the adult fish has remained a mystery up to now. Scientists of the Max Planck Institute for Developmental Biology in Tübingen have now discovered how these cells arise and behave to form the ‘zebra’ pattern. Their work may help to understand the development and evolution of the great diversity of striking patterns in the animal world. Beauty in the living world amazes poets, philosophers and scientists alike. Nobel prize laureate Christiane Nüsslein-Volhard, Director of the Department for Genetics at the Max Planck Institute for Developmental Biology, has long been fascinated by the biology behind the color patterns displayed by animals. Her group uses zebrafish as a model organism to study the genetic basis of animal development. The red arrowhead indicates a xanthophore that moves from the stripe region to the interstripe region while undergoing striking change in cell shape. The green arrowhead points to a xanthophore that extends transient filopodia. Numbered xanthophores undergo cell division during the course of this movie. New research by Nüsslein-Volhard’s laboratory published in Science shows that the yellow cells undergo dramatic changes in cell shape to tint the stripe pattern of zebrafish. “We were surprised to observe such cell behaviors, as these were totally unexpected from what we knew about color pattern formation”, says Prateek Mahalwar, first author of the study. The study builds on a previous work from the laboratory, which was published in June this year in Nature Cell Biology (NCB), tracing the cell behavior of silvery and black cells. Both studies describe diligent experiments to uncover the cellular events during stripe pattern formation. Individual juvenile fish carrying fluorescently labelled pigment cell precursors were imaged every day for up to three weeks to chart out the cellular behaviors. This enabled the scientists to trace the multiplication, migration and spreading of individual cells and their progeny over the entire patterning process of stripe formation in the living and growing animal. “We had to develop a very gentle procedure to be able to observe individual fish repeatedly over long periods of time. So we used a state of the art microscope which allowed us to reduce the adverse effects of fluorescence illumination to a minimum,” says Ajeet Singh, first author of the earlier NCB study. Surprisingly, the analysis revealed that the three cell types reach the skin by completely different routes: A pluripotent cell population situated at the dorsal side of the embryo gives rise to larval yellow cells, which cover the skin of the embryo. These cells begin to multiply at the onset of metamorphosis when the fish is about two to three weeks old. However, the black and silvery cells come from a small set of stem cells associated with nerve nodes located close to the spinal cord in each segment. The black cells reach the skin migrating along the segmental nerves to appear in the stripe region, whereas the silvery cells pass through the longitudinal cleft that separates the musculature and then multiply and spread in the skin. A striking observation is that both the silvery and yellow cells are able to switch cell shape and color, depending on their location. The yellow cells compact to closely cover the dense silvery cells forming the light stripe, coloring it golden, and acquire a loose stellate shape over the black cells of the stripes. The silvery cells thinly spread over the stripe region, giving it a blue tint. They switch shape again at a distance into the dense form to aggregate, forming a new light stripe. These cell behaviors create a series of alternating light and dark stripes. The precise superposition of the dense form of silvery and yellow cells in the light stripe, and the loose silvery and yellow cells superimposed over the black cells in the stripe cause the striking contrast between the golden and blue coloration of the pattern. The authors speculate that variations on these cell behaviors could be at play in generating the great diversity of color patterns in fish. “These findings inform our way of thinking about color pattern formation in other fish, but also in animals which are not accessible to direct observation during development such as peacocks, tigers and zebras”, says Nüsslein-Volhard – wondering how her cats got their stripes. Be the first to comment on "Scientists Uncover How Beautiful Color Patterns Develop in Zebrafish"